Was That the Best Super Bowl Ever? Somewhat incredibly, eleven men have quarterbacked their team to two Super Bowl victories. (Working from a sample size of 46 games, that sorta seems like a lot.) One of them is now Eli Manning. One of them is not Peyton Manning, Dan Marino, or Brett Favre. Manning is 31 years old and one of the five men to have won multiple Super Bowl MVP awards. It used to seem strange — as recently, honestly, as mid-December — that Eli Manning had once won a Super Bowl MVP. When will it stop feeling weird that he has two? One of the most fascinating — and impressive — aspects of Manning's two Super Bowl MVPs is that each time he has beaten Tom Brady, Brady played outstanding. (Lunatics notwithstanding.) Manning hasn't won two Super Bowls because somebody choked, or because the Giants caught a bunch of breaks, or because the Giants played conservatively to limit his mistakes, Dilfer-style. He has gone out and won these games, on his own. It's strange, because even in winning the MVPs, Manning has a way of blending into the background. The most famous plays from each game are considered more the result of the receiver's brilliance (David Tyree four years ago, Mario Manningham last night) rather than Manning's initial throw. (They're "The Catch," not "The Pass.") But Manning made both plays happen, from his mad scramble for space and time in Glendale to an absolutely perfect pass to Manningham, in the only place he could catch it. 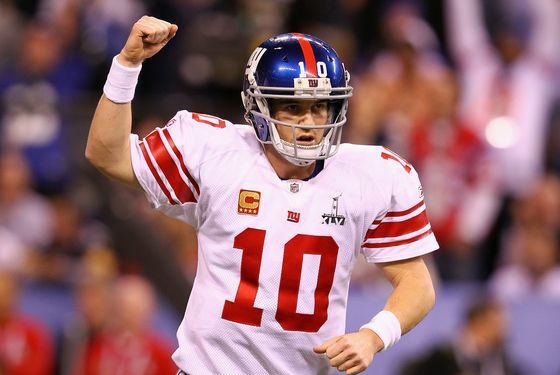 The Giants won each Super Bowl because of Eli Manning. He made them happen. This is really quite amazing. Much has been made about the fact that we have gone from "is Manning elite?" to "is Manning a Hall-of-Famer?" in the matter of about five weeks. But of course any notion of Manning as a Hall-of-Famer exists solely because of eight postseason games. You have to pick the right eight postseason games, too: In seasons in which the Giants don't win the Super Bowl, Manning is 0–3 in postseason games. Manning's regular season stats don't measure up — not even close — to current and impending Hall of Fame quarterbacks. He has built a résumé for the Hall of Fame — he has secured his place as one of the most important quarterbacks, and New York City athletes, of the last 25 years — essentially over two separate months of work. This is more common in other sports, specifically baseball. David Freese can go nuts for a fortnight and go down in history; David Eckstein, Jermaine Dye, and Mike Lowell have all won World Series MVPs in the last decade. Now, obviously, Manning is a better football player than all those men were baseball players, and he's smack in the middle of every play, after all. But so much of the narrative of Important Quarterbacks is about building, establishing, and securing legacies brick-by-brick, the way that Brady has, the way that Peyton has, the way that Elway (the foundation of the whole narrative, really) did. Eli has not done this. He has quarterbacked an underdog that sneaked into the postseason twice now, and he has bum-rushed the stage each time. Heck, if he does this again — and hey, why not? — he'll have more Super Bowl MVPs than anyone in NFL history. Eli freaking Manning. Ask Brett Favre and Dan Marino (and LeBron James) how much postseason success matters, how much it colors everything you're involved with the rest of your life. This is what we demand of our superstars: Playing their best on the biggest stage of all. It is beginning to look like Eli Manning — Eli Manning, the little brother who has been overshadowed in his family and in the culture since he was a child — might actually be better at fulfilling this demand than anyone else in football. What a wild way for this all to turn out. It is delirious and great in every possible way. It's a reason, honestly, to love sports with your whole heart.